Drop in and make a pair of earrings for yourself or as a gift for someone! This is a very basic form of jewelry assembly, no prior experience is required. Learning this skill may help you financially as the “winter holiday gift season” of various faiths approaches. 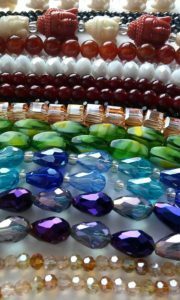 Beads and findings will be supplied in nickel-free gold and silver costume metal. Bringing a pair of basic round nose pliers will be helpful if you have your own. Expect total time commitment to be in the range of 10 to 20 minutes. Please limit one project per member so the maximum number of people can participate.